The story of Stasia Kelly was given to SQuire by Stasia’s husband. 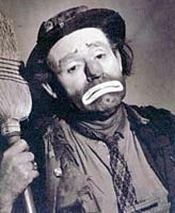 Stasia is the daughter of the famous, sad-faced clown, Emmett Kelly. She was taking a plane from Denver bound for Sarasota. That morning, her father’s face had been on the front page of the morning paper announcing his death. The night before, she talked to him on the telephone. He had sounded out of character and was reminiscing about his life. He regarded the day he asked her mother to marry him and the day Stasia was born as the happiest days of his life. 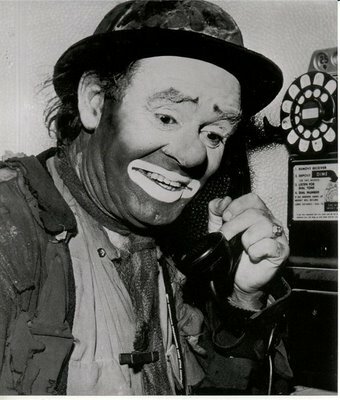 A photographer even captured the only picture of Emmett smiling, the day Stasia was born. Stasia knew that her father guarded his trademark frown so carefully that he never allowed himself to be photographed smiling, so this was a rare and special picture that was famous worldwide. As Stasia was sitting on the plane, she had a copy of the morning paper and an old paper with the picture of her father smiling. She reflected about the picture of her father smiling and it struck her that he was smiling about her. She began to cry. The man on the plane next to her asked her if she was all right. She whispered “yes” and that her father died this morning. The man’s face turned ashen as he told Stasia he was the man who took the picture. A peace suddenly overcame her and she felt that her father was by God’s side smiling down at her. The photographer, Frank Beatty, and Stasia became good friends. He even was the photographer at her wedding. To read the CBN article in its entirety, visit: SQuire Rushnell: The Wink of God. If you have a “God Wink” story you’d like to share, please feel free to post it here. I do believe that the more we pay attention ~ and celebrate ~ these gifts from the Divine, the more conscious we become of the ever-presence of grace in our daily lives. Much more to say on this … but it’s late & thoughts are still rumbling around in my brain. Call them coincidences synchronicity, or God winks, I DO think that when you begin to pay attention, you start to SEE these wonderful messages from the Divine much more frequently. Rushnell’s book When GOD Winks: How the Power of Coincidence Guides Your Life is available in both audio and print form.